1 pc. 15,75 EUR ea. This windscreen cover is an extremely practical protective cover in the summer and winter alike: It keeps your car cool in the summer and protects the windscreen from frost or snow in the winter. The foil is very light but stable and can be folded up and put away in the enclosed orange-coloured bag. 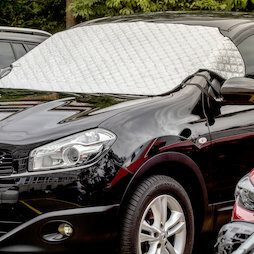 The black fabric of the windshield cover is soft to prevent scratches. The neodymium magnets are sewn into the fabric and pose no danger for the paint on your car. Please note that the width of 190 cm is the total width including the loops on the sides. The foil itself covers an approx. 135 cm wide windscreen. Unfold the car protective foil and place it on the bonnet with the silver side up. The 5 strong magnets that are sewed into the foil will keep it securely in place. Pull the foil over the windscreen. Attach the two elastic straps on your exterior mirrors. If you expect strong winds, it is recommended to jam the sides of the windscreen cover in the car doors. Attention: If the forecast calls for rain, you should keep them outside so the saturated cover does not get the inside of your car wet! 1 pc. 15,70 EUR ea. 1 pc. 290,42 EUR ea. 1 pc. 218,09 EUR ea. 1 pc. 144,49 EUR ea. 1 pc. 179,37 EUR ea.